Find out what the MSA 475407 Natural Tan Skullgard Hard Hat can do to save you from falling debris in the workplace, only here. You can also check out its amazing features for this review. If you are looking for a good quality, mid-range hard hat that offers maximum protection in harsh conditions then the MSA Skullgard Hard Hat equipped with the proprietary Fas-Trac suspension system is worth a look. It’s one of the best sellers in the market today because of its high-quality and over-the-top features without a super-high price tag. Additionally, it is an MSA product which is one of world’s leading brands when it comes to PPEs (personal protective equipment). This heavy-duty full-brim safety hard hat comes in natural tan color but other colors are also available (such as white, blue, yellow, brown, orange and green). The MSA 475407 Skullgard Hard Hat is a Type I Class G safety helmet which means that it mostly protects the top of the head and with a capacity to endure electrical voltage (dielectric protection) of up to 2,200 volts. This hard hat has many applications, including steel smelting foundries, welding, food processing, sanding and grinding, manufacturing, construction works, asbestos abatement, and other confined space work that needs head protection. This MSA Skullgard Safety Hard Hat also comes with a unique type of suspension called Fas-Trac III ratcheting suspension which is an MSA patented product that has a knob-operated system which could be adjusted to fit your head size. The MSA 475407 usually comes lighter than most safety helmets available that is why it is ideal to use in high-story construction buildings while it could also withstand elevated temperatures. This smooth-finished hard hat is made from multiple layers of resin-impregnated textiles, providing durable protection for your head. Also known as phenolic materials, these components are then laminated under extreme pressure and what result is a tough and strong safety headgear. There are a couple of available suspension systems that you can choose from when buying the MSA 475407, such as the Staz-on Pinlock Suspension and the Fas-Trac III Suspension. The latter is the one displayed below, but you can order the one that fits your needs. 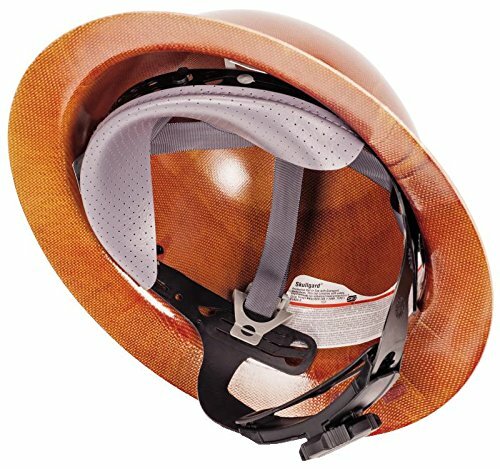 If you want safety headgear that is not expensive but still has the capability of other upscale hard hats, you may choose the MSA 475407 Natural Tan Skullgard Hard Hat as your head protection. Its safety features are undeniably one of the finest in head protection from falling debris or electrical cables in construction sites and other heavy industries which may result in severe injury, and worst, death. Moreover, the MSA 475407 Hard Hat complies to all available government requirements regarding head safety, so you are assured of its effectiveness in the workplace.